13 December 2018 - Centre Borschette, Brussels. The European Commission and the Austrian Presidency of the Council are inviting representatives from EU Member States and the European Parliament, industry and civil society to participate in the 2018 Export Control Forum. 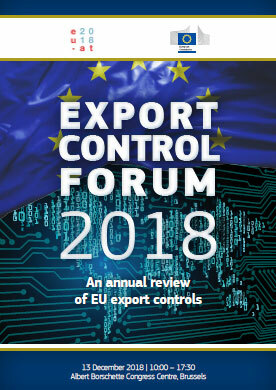 The 2018 Export Control Forum will provide an opportunity to make a review of the export control system in EU and to exchange information about its ongoing implementation. We will also review the state of play of the legislative process regarding the proposal for a modernization of EU export controls. The 2018 Export Control Forum will be opened by representatives of the Commission, the Presidency and the European Parliament, and will convene selected panels of experts, to be followed by open dialogue with the stakeholders. Time: 10:00 – 17:30. Registration will be open at 9:30. Language: The conference will be held in English. Travel/accommodations/lunch: Participants are responsible for their own travel and accommodation arrangements. Refreshments during the conference and a sandwich lunch will be provided. Registration : At present we have reached the maximum number of participants. If you register now, you will be on the waiting list. You will be notified by a confirmation mail if a seat becomes available. A participation confirmation will be sent to the email address provided. Web streaming: The entire event will be web streamed.